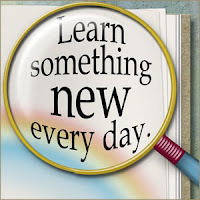 Homeschooling, unschooling, roadschooling, whatever you call what we're doing, we're learning. Living on the road makes that very easy, but of course it's easy anywhere, because you learn something new every day. We thought we'd test that theory and make it a goal requirement prerequisite for happiness something to talk about at dinner. The Great Math Experiment is over and our hypothesis was confirmed. After years of no math, we stuck Josh and Lizzy in an online math class to see if they could "catch up". They did (with a pretty poor effort) and got a B and C. It was tiring though, proving their knowledge with assignments and tests, and even proving our parental involvement with required calls and emails. Lizzy said "Mom, you couldn't be more involved, we live in 40 feet." (Of course that's actually 400 square feet, which could explain her C.) So, no more of that! We're going back to just learning for fun! Maybe even something new every day. Of course they stick to us like leeches watch us like hawks too, and learn about whatever we're doing. Refinishing tables, remodeling, truck maintenance, hunting safety, fantasy football, grocery budgeting, cooking, complaining about (but always paying) taxes, etc. They're never far - literally, we live in a box - so we're always learning from each other, something new, every day. Hey, girl! Yes, our kids are always learning and there just isn't a way to measure it. Keep on keeping on! You're doing great! See you in Orlando.